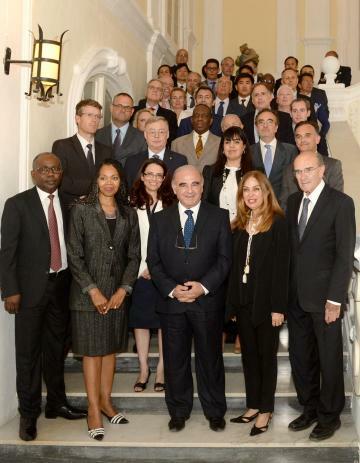 The International Institute for Justice and the Rule of Law was launched in Malta during a ceremony at the Ministry for Foreign Affairs in Valletta. Besides hosting the seminar, Malta is also one of its co-founders together with Algeria, France, Italy, Jordan, Morocco, the Netherlands, Nigeria, Tunisia, Turkey, United Kingdom, and the United States. The mission of this institute, which will collaborate closely with the United Nations and other international and non-governmental organisations, is to provide rule of law-based training to lawmakers, police, prosecutors, judges, corrections officials and other justice sector stakeholders on how to address terrorism and related transnational criminal activities within a rule of law framework. The IIJ will initially focus on countries in north, west, and east Africa, and the Middle East, paying particular attention to supporting countries in transition. The Institute will be permanently housed at a 16th century armoury, which will be refurbished into a modern training facility. In the meantime, it will be hosted within the University’s Valletta Campus, which will facilitate the development of an enduring partnership between the new centre and Malta’s oldest university. Foreign Minister George Vella expressed the government’s satisfaction at having been entrusted with hosting the institute saying this was a clear endorsement of Malta’s constructive regional role. Malta, he said, would be taking active steps to ensure that the vision and goals of the institute were fully achieved. Dr Vella welcomed the focus being placed by the institute on the establishment of rule of law and judiciary reforms in countries undergoing wide-ranging changes. The inauguration was also attended by Prime Minister Joseph Muscat and US ambassador Gina W. Abercrombie-Winstanley.